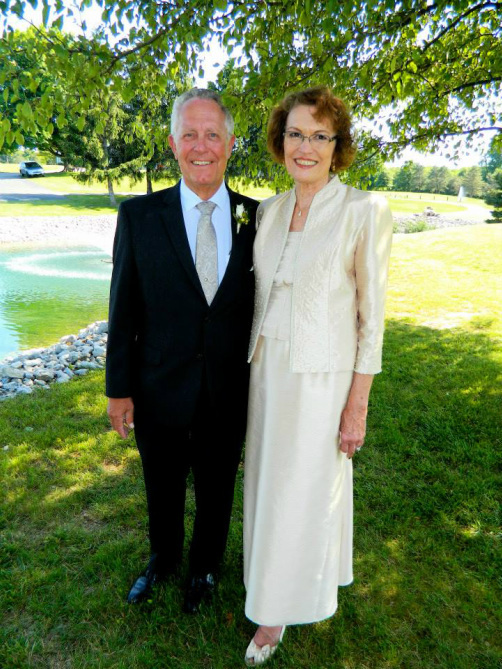 "On June 14, 2014 Ms. Marilyn Hibner Hoehne and Mr. James York were married at Sts. Peter and Paul Catholic Church in Newport, Ohio in what can only be called a true love story. Ms. Hoehne and Mr. York met as flower girl and ring bearer in the wedding of Marilyn’s uncle, Robert Hibner and Jim’s aunt, Elizabeth Borchers at that same church on June 14, 1950. Their story is full of interesting turns and can only bring smiles to those who have followed it. After the wedding they did not see each other again until many years later. Marilyn lived in Dayton with her parents until her father was transferred to California when she was thirteen years old. When Marilyn was fourteen, her parents came back to visit with family in Coldwater. Aunt Betty thought it would be “cute” to have her flower girl and ring bearer meet each other again, so invited Jim’s parents to bring him to their home in Coldwater. The youngsters were both surprised that the other had grown up in the time since they had met and they agreed to stay in touch. They exchanged letters occasionally, and were busy with school and other things. In the summer of 1963, the Hibners made another visit to Ohio. By this time, Jim had graduated from high school, been through active duty in the Air Force Reserve, started college, and was working a summer job. He had also started dating Ann Wagaman, the girl who would be his loving wife for 47 years and the mother of his four sons. This time, when Jim and Marilyn met at her grandparents’ home, he offered to set her up on a blind date with one of his best friends, Cyril Hoehne. She accepted, and they double dated to see a movie. Cy was very impressed with Marilyn and they began dating after Marilyn moved back to Dayton to attend college there. They married in 1967, and had two beautiful daughters. The story does not end there. While Cy and Marilyn were dating, Cy introduced Jim’s brother Denny to Marilyn’s cousin, Trudy Wartinger. They in turn introduced Jim and Denny’s cousin, Tom Watren to Trudy’s friend Charlene Sitzman. Eventually, those couples married, and are still happily married today. The group always remained good friends and had many good times together. In the 1970’s Cy and Marilyn moved to Oklahoma, and eventually to the Atlanta, Georgia area, but always stayed in contact with their families and friends in Ohio. In 2008, Cy passed away. Marilyn divided her time between the Atlanta area and the Jacksonville, Florida area to be near her two daughters and grandchildren. In 2012, Ann passed away. In the ensuing months, Jim took several trips to various locations to try to work through his loss and to regain some perspective. On one of the trips to Jekyll Island with two other couples of mutual friends, Jim and Marilyn decided to try seeing each other in a dating relationship. This presented something of a challenge, since they lived sometimes 500 miles and at other times 1,000 miles apart. They realized that if the relationship was going to work out, they would have to spend a lot of time on the road. Since they both had fairly spacious accommodations, it was possible to spend time at each other’s homes. They soon found that they had a great deal in common, cared very much for each other, and decided to be married. As an interesting side note, Bob and Betty Hibner were the founders and owners of Hibner’s Jeweler in Coldwater for many years. Bob and Betty have sadly now both passed away. The store is now owned by their son Joe and his wife Brianna. Jim had purchased Ann’s engagement and wedding rings there in 1964, and Cy had purchased Marilyn’s rings there in 1967. In 2014, the rings for the new couple also came from Hibner’s. Jim’s parents were the third couple to be married in the current Sts. Peter and Paul church building in Newport in 1938. Marilyn’s children were baptized there and her husband’s funeral occurred there, and he is buried in the church cemetery. The matron of honor in Marilyn and Jim’s wedding was Trudy York, who had also been the maid of honor in Marilyn’s first marriage to Cy. The best man was Denny York, who had been Jim’s best man in his marriage to Ann. The couple enjoys traveling and they plan to divide their time among their homes in Ohio, Georgia and Florida when they are not off on a sightseeing adventure. Incidentally it recently occurred to the couple that Jim’s middle name is Robert. Marilyn’s middle name is (you guessed it) Elizabeth."